China’s ministry of finance (MOF) said Wednesday it has allocated 303 million yuan ($48.6 million) to aid in prevention of human infections of the H7N9 avian flu. The money will be used to subsidise projects aimed at monitoring cases of H7N9 infection, the MOF said in a statement. China’s ministry of human resources and social security on Wednesday ordered local authorities to allow medical insurance programmes to cover more medicine and services for H7N9-infected patients to reduce the financial burden on them. Twenty two people have died and 109 people have been infected so far in the Chinese mainland and Taiwan, official data showed. 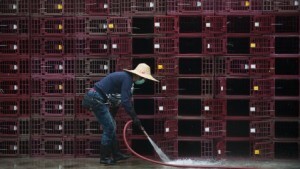 Visiting WHO officials have said there is yet no evidence of sustained human-to-human transmission of the H7N9 virus.